It’s getting cold now. It’s time to shift from cold and wet salads to comfort foods. Below is a warming and nourishing dish for you to try this week. Make extras for leftovers. 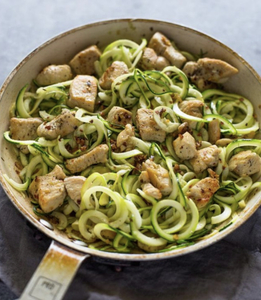 Tip: When cooking the zoodles, make sure you don’t overcook. Zucchini gets soggy. The recipe calls for 1 minute, please be mindful of this. The zucchini should be al dente. Add olive oil and minced garlic. Cook garlic for 30 seconds to 1 minute or until fragrant. Be careful not to burn garlic. Add chicken, red pepper flakes and salt and pepper. Cook chicken for 5-6 minutes or until golden and cooked through.